my 10 month old son Marco is wearing my costume.....I got the idea from pinterest. I crochet his hat then strung white string "noodles" throughout it.....then I took a long piece of string and stung more "noodles" to tie around his neck. 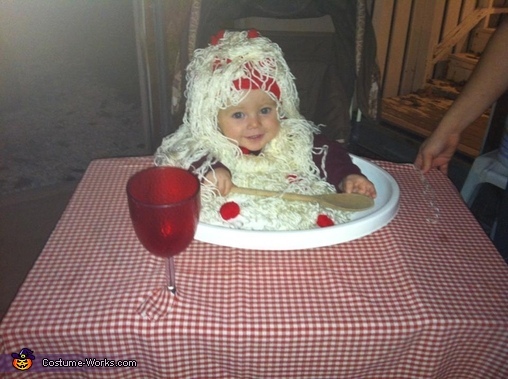 then I made "meatballs" out of yarn and tied them all around the costume. Then I used a box and zip tied it to his stroller and cut and glued a table cloth to it....then I cut out an area for him to sit in his stroller and used a plastic bird feeder for a plate and zip tied it to the box with the table cloth....then I put string on the plate and decorated the table with a cup and a few other random things. people loved it....he won 2 different Halloween costume contests! !